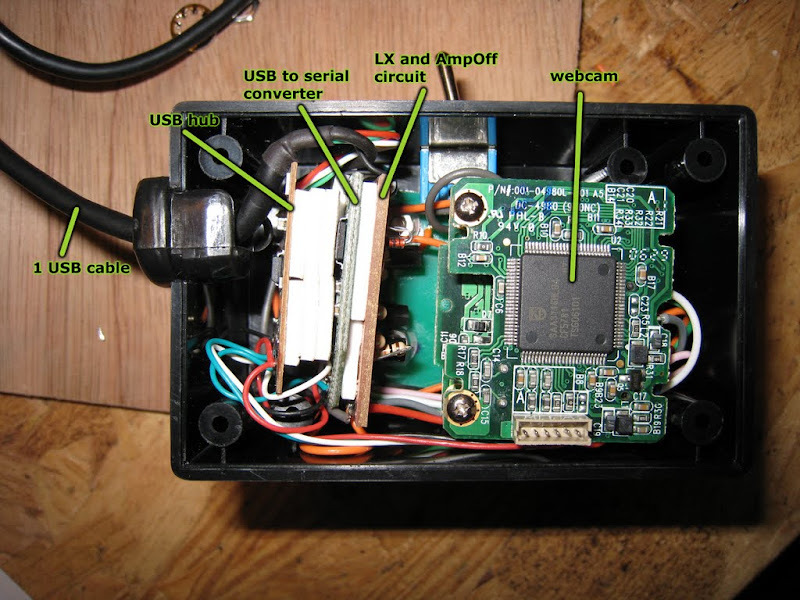 I have finally done the LX and amp off mod on one of my SPC900 webcams. With the LX mod the webcam can take Long eXposures of several seconds controlled by a computer via serial port. Using a serial port status line (RTS) the computer can open and close the shutter of the camera. The AmpOff mod disables the image amplifier; also controlled via another serial port status line (DTR). If left on, the image amplifier can cause a red-pink-ish glow on long exposures. I wanted as few cables as possible, so I made a version that really only needs one USB cable to the modded cam. Most other mods I've seen required a separate serial cable between computer and camera. Result: One LX and amp off modded SPC900 that only requires a single USB cable and is not that much bigger than the original webcam. The switch disables the mod and puts the camera back in normal mode, as if nothing happened. 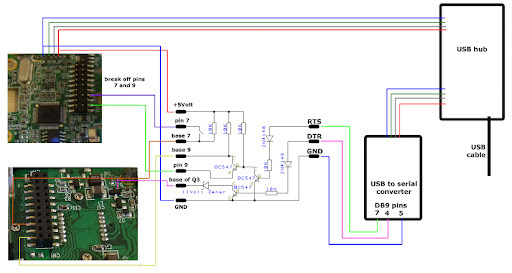 Choosing a USB to serial adapter can be a bit tricky. For these mods you need one that supports the handshake lines RTS and DTR, not only the serial data lines (we don't even want to send any data). I also wanted one where Win 7 64bit drivers were available. I found out that the Prolific PL-2303 chip fits the bill. So any USB to serial adapter cable with that chip will work fine. The circuit board is in the serial plug of the cable. So I carefully cut it open and unsoldered the USB cable (make a note of which wire goes where). The most difficult part is to get rid of the DB9 plug without damaging the solder pads on the PCB. Once you got it off you got a nice small USB to serial PCB. The USB hub board was obtained in a similar fashion. I specifically selected a USB hub model that had external USB plugs (see 3rd picture on this page). This makes the PCB a lot smaller as it does not have to accommodate the USB sockets. I just opened the hub and unsoldered the USB cables.